So you took the plunge and treated yourself to a drone and as soon as you could handle the controls and get it to fly without crashing, you thought: “Why not use it for security purposes?” It’s definitely a case of ‘buyer beware’ with drones though, and we urge you to read the legalities behind using a drone for security purposes. Remotely piloted aircraft systems (RPAS), which are now popularly referred to as ‘drones’, have been used in South Africa since 1994 and quickly became the ‘toy’ of choice for many hobbyists who fancied themselves as amateur pilots. Now used for a variety of non-military/non-commercial tasks, including remote aerial photography, fishing (yes!) and voyeurism, drones come in a number of shapes, sizes, configurations and capabilities. The South African Civil Aviation Authority (SACAA) regulates civil aviation activities to ensure acceptable levels of aviation safety and security within both the corporate and commercial sectors. In legislation promulgated on 1 July 2015, SA-CAR Part 101 outlines various types of operation, including restricted visual line of sight (R-VLOS), visual line of sight (VLOS), extended visual line of sight (E-VLOS), beyond visual line of sight (B-VLOS), operations in controlled airspace and operations at night. SA-CAR Part 101 stipulates that only a person with a valid Remote Pilot Licence (RPL) and who is working for a registered aviation company (with a remote operating certificate – ROC), may operate a drone. 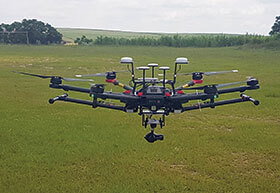 These two factors alone, says Clint Steytler, director of flight operations at DC Geomatics and Drone Media, separate the men from the mice in professional drone operation. While the drones operated by hobbyists are affordable, the larger, more complex drones used by professional operators are extremely expensive to own and maintain. Furthermore, obtaining an RPL is time-consuming and costly, and added to this are incidental costs, such as air service licences and the remote operating certificate. This is most likely why only 20 companies in South Africa have licences to professionally operate drones. With regard to their use in security surveillance, there are certain limitations to the operation of a drone that impact on its use. Firstly, one needs to obtain prior permission to fly over an area, with special emphasis here on estates. Since drones normally have only a 20-30 minute battery life, operations requiring 24-hour surveillance would necessitate the use of a very expensive military drone, which has extended battery life. In a similar vein, the sensor which needs to be used for security footage can cost anywhere from a few thousand up to millions of Rands, making the technology inaccessible to many. Drones may only be operated in weather conditions that allow unobstructed visual contact between the drone and other airspace users, as well as with the operator, unless they are to be used in B-VLOS or night operations specifically approved by SACAA. Public roads may not be used for landing or taking off, except in cases of civil defence or law enforcement operations as approved by SACAA. General rules pertaining to commercial use of drones include the fact that they may not fly directly overhead any person or group of people within a lateral distance of 50 m unless approved by SACAA. In addition, no drone may be flown within a lateral distance of 50 m from a building or structure unless approved by SACAA and with permission from the owner. A functioning air-band radio must be used by the registered operator and should be tuned to the frequency of the air traffic unit controlling the area or airspace in question. In all instances of operation, the drone should have an appropriate separation from other aircraft. “Estate managers wanting to employ a drone operator need to be aware that they will be responsible for ensuring that the operator complies with the requirements for drone operation under the SA-CAR Part 101. They must ensure that the privacy of residents/tenants is not compromised and that they will be jointly responsible, along with any illegal operator, for any damages incurred to property or person,” Steytler cautions. Some mines and National Keypoints request day-night drone surveillance. It must be noted that there are currently only two companies that are permitted to operate drones at night. Steytler explains that any company wishing to operate a drone in the dark is required to display to SACAA, via an Operations Specification, that they wish to operate at night and they then undergo a rigorous accreditation process. The drones used for night-time operation are of the highest quality and have target location and thermal night vision capabilities to ensure complete accuracy and outstanding video and picture definition. Steytler says that currently some of the larger mining operations are using drones for eye-in-the-sky footage of labour riots at a suitable distance that allows them to comply with the regulations. This footage allows them to see who the instigators are for further disciplinary action. “The bottom line here is that organisations or estates wishing to employ the services of a drone operator, need to perform a due diligence on them and ensure that the necessary licensing and certification is in place. There is definitely a role for drones to play in security surveillance, but one needs to be aware of the legislation governing the use of the drones. Companies such as DC Geomatics are able to provide a turnkey solution as well as undertake eye-in-the-sky and emergency response operations, whereby we would send an incident report with the accompanying live feed,” says Steytler.